Join the “Harbour of Light Parade” and enjoy exclusive views of Sydney’s two spectacular fireworks displays on a six-hour New Year’s Eve cocktail cruise! Your New Year’s Eve cocktail cruise departs from King Street Wharf aboard the Bella Vista, specially designed to provide 360-degree views on every level through 10-foot-high (3-meter) windows and the open-top deck. Join the Harbour of Light Parade a procession of decorated vessels invited to cruise in the exclusion zone in the middle of Sydney Harbour. Cruise up and down in the center of the exclusion zone for the very best views of Sydney’s skyline and harbor. Nibble on cocktail snacks, enjoy wine, beer or soft drinks from the licensed bar and be in prime position to watch the fabulous 9pm fireworks display. Then count down the final minutes of 2014 and feel the excitement build as the Bella Vista joins an exclusive flotilla of boats to watch the spectacular midnight fireworks display. 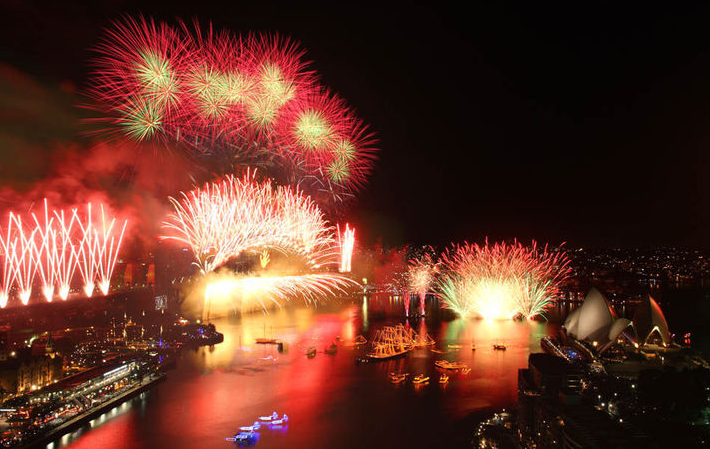 See fabulous views of the Sydney Harbour Bridge and its special display of cascading lights and symbols, known as ‘the Bridge Effect’, and celebrate as the year ticks over into 2015.Your six-hour New Year’s Eve cruise continues with more music and dancing, returning to the King Street Wharf at 1am.